The U.S. women are a virtual certainty to win the gold medal in the gymnastics team event at the Rio Olympics. The story may be different on a four-inch-wide balance beam, but on a 10-inch-wide sheet of paper, the U.S. women are a virtual certainty to win the gymnastics team title in Rio. While Simone Biles is a solid favorite to become the fourth straight U.S. woman to win an Olympic all-around title. So what’s really at stake for the gymnasts competing at the women’s Olympic Trials in San Jose on Friday and Sunday? For most of the gymnasts... not much. Martha Karolyi, the program director for the U.S. women’s team, has the team measured in her head, as she often does ahead of national championships and trials. So nearly everyone is either already in or out. Still, each gymnast will perform two routines with one last chance to impress Karolyi and the selection committee that’s responsible for choosing the five gymnasts who will compete in Rio. The team will be announced after Sunday’s final event. 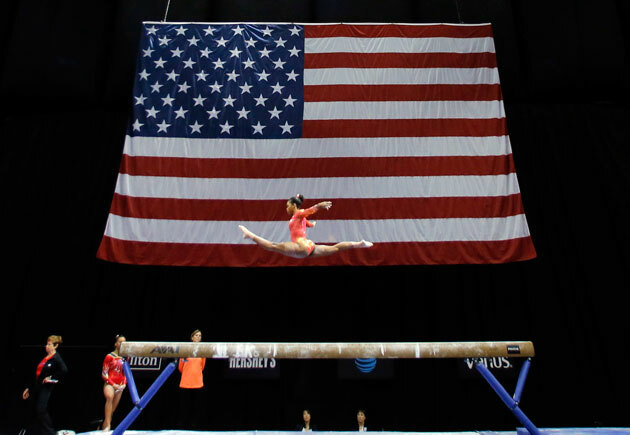 After the U.S. Nationals in St. Louis last month, a competition that also doubled as the Olympic trials for the U.S. men, Karolyi said she was pretty convinced she had the five gymnasts in mind, though she left the door open a crack for one modification. Of course, things can happen, including injuries and striking variances in performance that could shift a selection. But barring that, it is likely that four of the five spots are set in hardened gym chalk with a fifth spot available to help lessen the team’s weakest link in the team competition, the uneven bars. And weak is a relative term. Last fall at the world championships in Glasgow, the women finished more than five points ahead of silver medalist China in the team competition. The U.S. has also won five of the last seven world team titles. It’s a far cry from past decades when the Soviet Union was an equally strong favorite, with the occasional push and upset from and upset at the hands of the Romanians. This time around, the Soviet Union, long since broken up, will still yield a formidable Russian team. The usually powerful Romanians did not even qualify for the team competition. The trials should be a coronation for Simone Biles, the reigning three-time world all-around champion, who has dominated a pre-Olympic quadrennium as few gymnasts ever have. Biles will be on the team sure as you can say Nadia Comaneci, the gymnast who is the reference point for what Biles is doing these days. The 19-year old Spring, Texas native has upgraded each routine from 2015 and has added a tougher second vault to her arsenal—making her a threat to win that individual event that requires attempts from two different families of vaults. For Biles, think of the competition in San Jose as a warm-up for the Rio Games. When Gabby Douglas and Aly Raisman, two of the Fab Five who won team gold in gold in London, started talking comeback two years ago, the history books were not in their favor. Many female gymnasts have tried to return to their old form only to find that the standards of the sport and their own growth spurts had passed them by. Still, Karolyi has been leery of Douglas’ extracurricular activities at times. The Olympic all-around champ has been on magazine covers and TV shows and even has cameras from a reality show following her around. “Gabby’s history is that she has been good at the end, good when she has needed to be,” Karolyi says. That, and her ability to do a good bars routine, should keep her safe for Rio. Raisman, the Olympic champ on floor in London, has been the one to defy odds the most. By her admission she had put on “way too many pounds” after the London Games and took time off to participate on Dancing with the Stars among other things. When she returned to training, her coach, Mihai Brestyan, didn’t even let her get back on the apparatuses until she went through a torrid conditioning program. Now Raisman sleeps 10 hours a day, her stamina is as good as ever and her repeat Olympic prospects are strong, too. Hernandez has made such stunning progress over the past year that she could end up being the team’s second all-arounder in Rio, after Biles. Karolyi often likes the idea of having a younger member joining a world or Olympic team if she can stand up to the pressure. In St. Louis, the teen from New Jersey seemed to pick up where she left off in 2015, when was U.S. junior all-around champ. She won bronze medals on bars, beam, floor and in the all-around at Nationals, competing with great poise for someone who had just turned 16. If the Olympic favorites have a weakest event, it is bars, an apparatus that was also the team’s weakest four years ago, but has often been a strong spot for U.S. teams of the past. The U.S. team needs three gymnasts on each apparatus in the team final and Biles and Douglas will likely be two of the bars participants. Raisman is comparably weak on the event and Hernandez could be the third member, but more than likely, the team will want someone who is a bars specialist and could sub in on another apparatus if called upon. Kocian, 19, is the likely pick, having lodged in a historic four-way tie for world gold in 2015. She was also a world team member in 2014 and can get by on beam and floor in a pinch. She is the most likely candidate for the fifth spot on the team. If not these five, who are the other options? Maggie Nichols: At 18, Nichols is a veteran, a member of the world team in 2015 and a World Cup all-around medalist in 2014. Nichols’ prospects appeared bright after placing second behind Douglas at the American Cup in March. But soon after, she suffered a meniscus tear during vaulting training and only competed on bars and beam at nationals. Karolyi said after that meet that Nichols would need to show significant improvement to be considered for Rio, especially since spots on her strongest events, floor and vault, appear to be taken. Ashton Locklear: A member of the world team in 2014, Locklear, 18, scrapped plans to compete for the Florida Gators in order to take a crack at the Olympics. She outpointed Kocian and others to win the national title on bars last month, and she also competes on beam, but does not do floor or vault. Ragan Smith: Smith will turn 16 during the Rio Games, and her best days may be a year or two away. She won beam and floor at the junior nationals last year, and took the balance beam title at the Pacific Rim championships earlier this year, but seemed unnerved at her first senior nationals in St. Louis, where she made several small errors. It would take something unforeseen for Smith to earn a place.